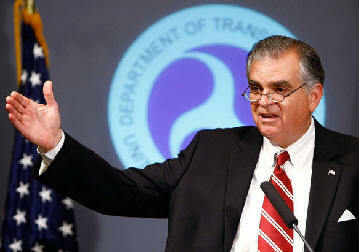 May 13, 2010 - U.S. Transportation Secretary Ray LaHood announced the members of a new committee on the future of the U.S. aviation industry, which will hold its first meeting on May 25 in Washington. The Future of Aviation Advisory Committee was formally established in March to provide information, advice, and recommendations to the Secretary on ensuring the competitiveness of the U.S. aviation industry and its capability to address the evolving transportation needs, challenges and opportunities of the U.S. and global economy. The committee will focus principally on five issue areas: ensuring aviation safety, ensuring a world-class aviation workforce, balancing the industry’s competitiveness and viability, securing stable funding for aviation systems, and addressing environmental challenges and solutions. The advisory committee grew out of a forum last November hosted by Secretary LaHood on the future of the U.S. aviation industry, during which he urged attendees to nominate potential committee members. The members selected represent airlines, airports, labor, manufacturers, environment, finance, academia, consumer interests, and general aviation stakeholders. The committee will meet at least four times over the next year, after which it will issue its recommendations to the Secretary. Juan J. Alonso, Associate Professor, Department of Aeronautics and Astronautics, Stanford University; Susan M. Baer, Director, Aviation Department, Port Authority of NY/NJ; David Barger, President and CEO, JetBlue Airways Corporation; Bryan K. Bedford, Chairman, President and CEO, Republic Airways; Severin Borenstein, Professor, HAAS School of Business, University of California, Berkeley; Thella F. Bowens, President and CEO, San Diego County Regional Airport Authority; John M. Conley, International Administrative Vice President and Air Transport Division Director, Transport Workers Union of America, AFL-CIO; Cynthia M. Egnotovich, Segment President, Nacelles and Interior Systems, Goodrich Corporation; Patricia A. Friend, International President, Association of Flight Attendants-Communications Workers of America, AFL-CIO; Robert L. Lekites, President, UPS Airlines; Ana McAhron-Schulz, Director of Economic and Financial Analysis, Air Line Pilots Association; William J. McGee, Consultant to the Consumers Union; Daniel McKenzie, U.S. Airlines Research Analyst, Hudson Securities; Jack J. Pelton, Chairman, President and CEO, Cessna Aircraft Company; Nicole W. Piasecki, Vice President, Business Development, Boeing Commercial Airplanes; Raul Regalado, President and CEO, Metropolitan Nashville Airport Authority; Glenn F. Tilton, Chairman, President and CEO, UAL Corporation; and Christopher J. Williams, Chairman and CEO, The Williams Capital Group. The first meeting of the committee will take place on May 25, beginning at 9:30 a.m. and ending at 3:30 p.m. at DOT Headquarters, 1200 New Jersey Ave., SE, Washington, DC. Meetings will be open to the members of the general public who have registered to attend in advance on a first-come, first-serve basis as long as space is available.